ErinChris Photo Blog: New Toys! Chris and I decided we needed a few more things to be better equipped for wedding season, so we picked up a few more "toys". After seeing the amazing color that my 5D produces, Chris was too jealous to not get one of his own. The colors that come out of this camera are incredible. Next, the two new lens additions are the 24-105mm f/4L and the 135mm f/2.0L. Chris had been using the 24-70mm f/2.8L which is a great lens, but it just couldn't get in tight enough during a ceremony. I mean, I know we smell good, but we can't be all up in the bride and groom's face as they share their vows and first kiss. I am lucky enough to have the 70-200 f/2.8L IS which is my favorite lens for staying out of the way but getting zoomed in just enough. Actually, I'm pretty sure its my favorite anytime lens too. Both of the new lenses are great in their own way. The 135mm is incredibly sharp and when used on the 30D can get you quite a lot of zoom. And talk about bokeh (which is background blur for the non-photographers)! 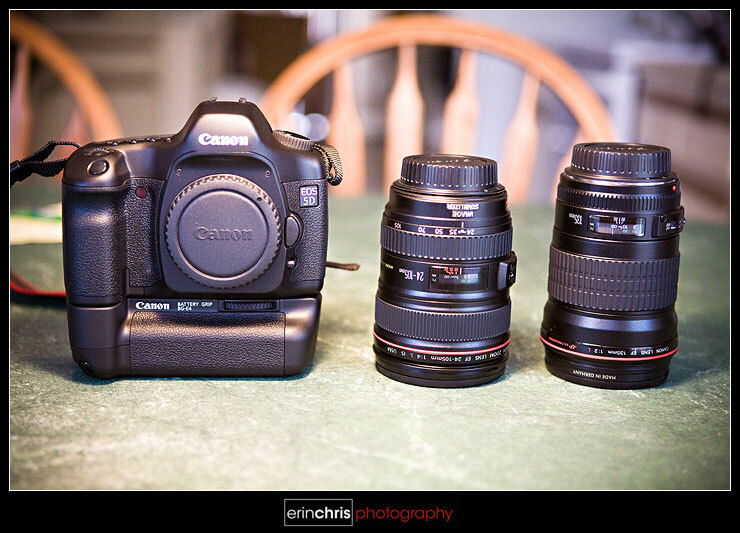 So Chris is going to keep that lens on the 30D and the 24-105mm on the new 5D during the ceremony. This way he can get some wide shots with the 24mm on a full frame sensor and get nice and zoomed in with the 135mm on the 30D. Well I've been thinking about going Boda for the past couple weeks...if I hear you two like it, I'm going to have to concede defeat and pick one up! Congrats on the new gear! That 135 f/2 is a sweet lens! Awesome stuff. I wanna try that 135L the next time we meet up!